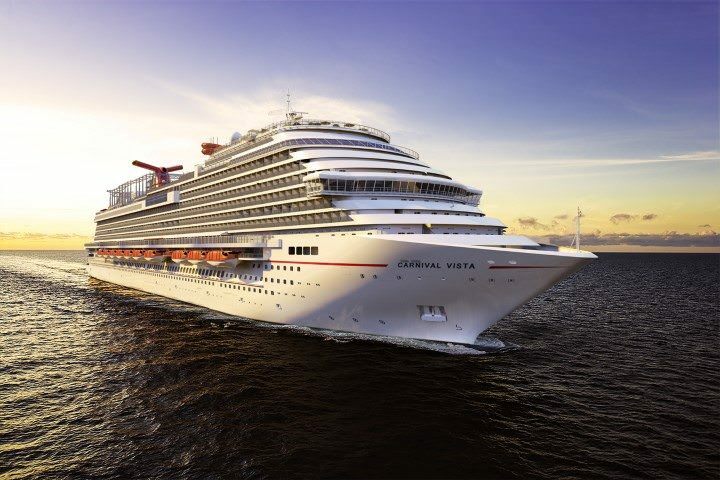 Carnival Vista, Carnival’s newest and largest Fun Ship to-date, sets sail on May 1, 2016. Rendering courtesy of Carnival Cruise Line. At first glance, Carnival Cruise Line’s Carnival Vista looks a lot like her predecessors, Carnival Dream, Carnival Magic and Carnival Breeze. Known collectively as the “Dream Class” ships, these vessels represented an entirely new design for the popular cruise line. Gone were the sharp, angular lines of past vessels like Carnival Triumph and the wacky, neon-heavy interiors created by in-house designer Joe Farcus. Carnival Magic was the last Carnival ship to be designed primarily by Farcus; his whimsical (and controversial) designs were phased out aboard Carnival Breeze in 2012 in favor of a more contemporary design created by PartnerShip Design of Germany. But a whole host of changes have been prepared for Carnival Vista. Aside from her exterior looks, her interiors have little in common with the other Dream-class ships. Her general arrangement plans – a generic term for the layout of public areas and staterooms – have been completely overhauled. Guests will find new stateroom choices, new amenities, new public rooms, and a host of small changes that run right down to the placement of the ship’s elevators. 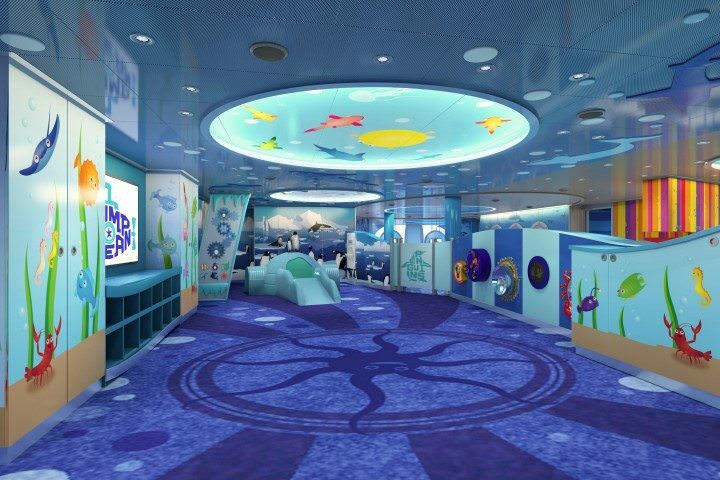 Family-friendly amenities, like this Camp Oceans playroom designed just for kids, are a big part of the forthcoming Carnival Vista. Rendering courtesy of Carnival Cruise Lines. Carnival Vista was designed primarily with families in mind. 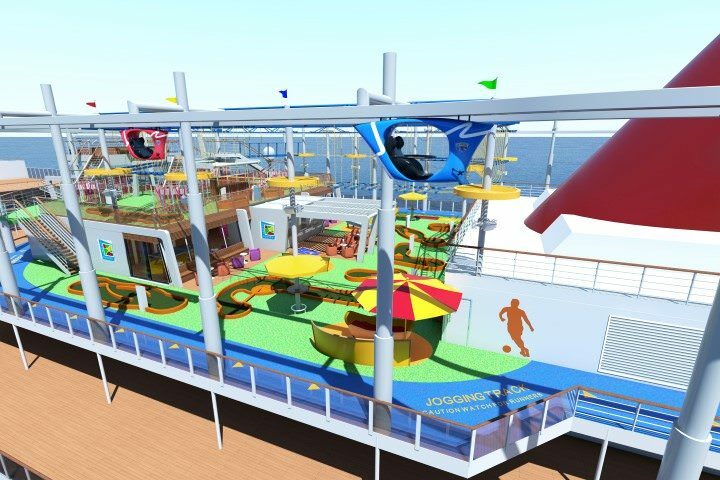 Embodying the line’s motto of Fun For All, All For Fun, the new Carnival Vista will offer families more options than ever before, including a suspended cycling experience called SkyRide and new Family Harbor Staterooms and suites that feature a “family concierge” and expanded space. Also featured is SkyRide, a first-of-its-kind aerial attraction at sea. Here, adventure seekers pedal hanging recumbent-like cycles at speeds of up to 18 miles an hour across an elevated 800-foot-long track, while enjoying panoramic views to the sea 150 feet below. Best of all, Carnival has announced that there will be no additional charge for Sky Ride. 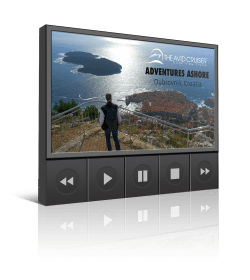 Get ready for the SkyRide aboard Carnival Vista. Rendering courtesy of Carnival Cruise Line. Nearby, SportSquare features a 270-foot-long suspended ropes course, a two-level miniature golf course, a 700-foot-long jogging track, a variety of outdoor fitness equipment, and the new Clubhouse, a modern indoor sports hangout with mini-bowling, ping-pong, sports-themed video games, and arcade-style sports games. Carnival’s elaborate WaterWorks waterpark returns aboard Carnival Vista, in its largest incarnation yet. It will be anchored by the Kaleid-o-Slide, Carnival’s first inner-tube slide. Riders can zip down 455 feet of exhilarating corkscrew turns enhanced by music and stunning kaleidoscopic effects. There’s also the PowerDrencher, a tipping bucket filled with 300 gallons of water. A special area with 30 different water spray toys and mini-racing slides will be available for younger cruisers. Goodbye, Glass Elevators. Hello, IMAX. 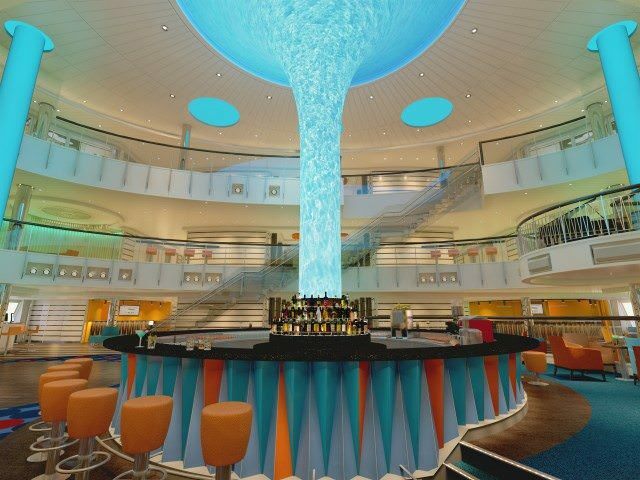 Carnival Vista introduces an entirely new atrium design, one that might be a touch controversial. For the first time in nearly three decades, a Carnival ship will lack glass elevators in her atrium, which will only extend three decks in height. In the past, Carnival’s atriums have been dedicated social hubs surrounded by glass elevators and topped with a glittering glass skylight. 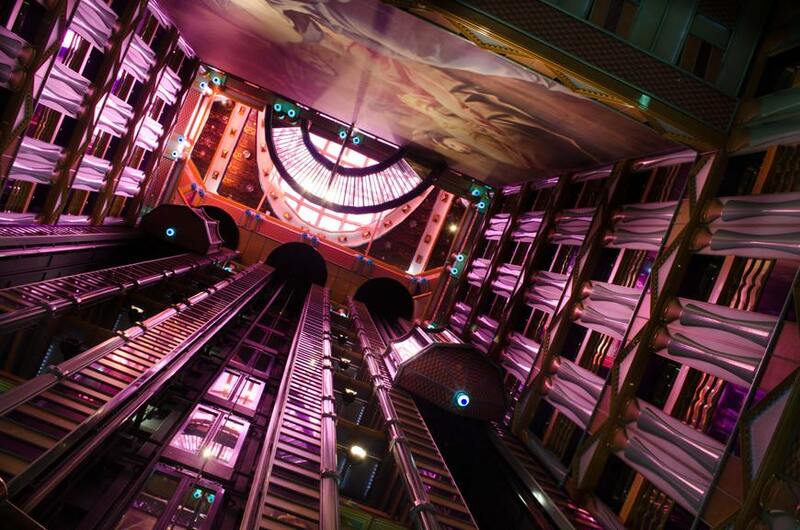 The atriums aboard Carnival Dream and her sisters span an astonishing 11 decks in height. The redesigned Atrium concept aboard Carnival Vista provided the extra space needed to squeeze in the first IMAX Theatre at sea. Rendering courtesy of Carnival Cruise Line. But atriums take up a huge amount of space; space that might be better used by staterooms and other features. In the case of Carnival Vista, Carnival is using this reclaimed space to house a three-story IMAX theatre positioned between Decks 7, 8 and 9. It’s a first for the industry, and we love the idea of an IMAX at sea. We are, however, a little nervous for the staterooms that surround it. Let’s hope the soundproofing is on the money. 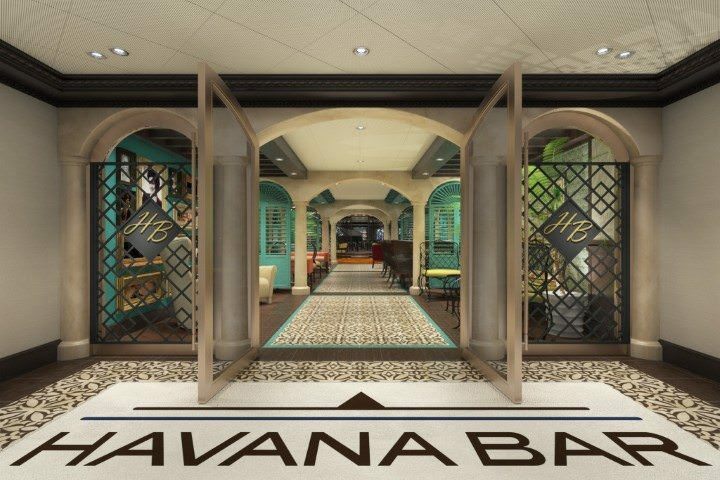 The Havana Bar brings a slice of Cuba to Carnival Vista. Rendering courtesy of Carnival Cruise Lines. The general layout of bars and lounges onboard is changing dramatically, and it’s likely to be change for the better. 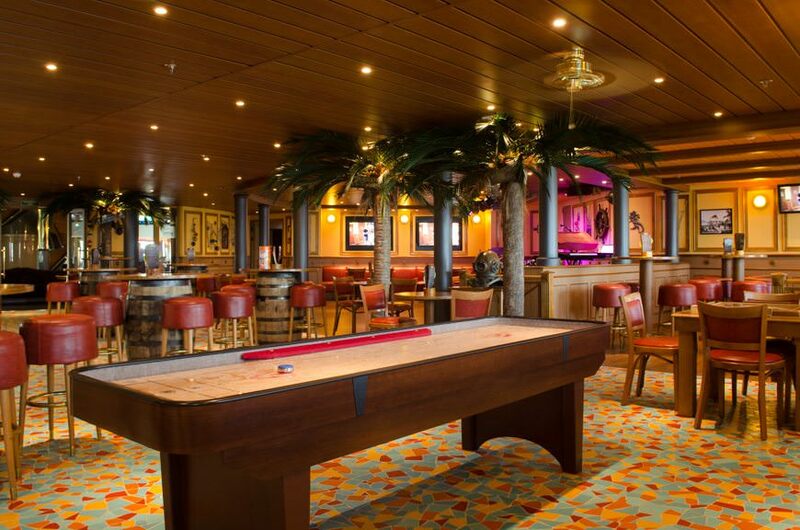 With the expanded Promenade Deck known as The Lanai on Deck 5, Carnival will now offer outdoor seating options in a number of bars and dining venues, including the Fahrenheit 555 steakhouse; Bonsai Sushi; Cherry on Top candy and ice cream bar; the RedFrog Pub, and the stylish Havana Bar. The intimate Library Bar, introduced aboard Carnival Breeze, returns on Carnival Vista – also with indoor and outdoor seating options. At the RedFrog Pub, Carnival will serve up microbrews and pints of its own tasty libation, ThirstyFrog. The ship will also brew its own beer onboard: During each sailing, with two giant copper-topped glass kettles that will feed straight into the bar taps or, creatively, to taps situated right on individual tables. If beer isn’t your thing, not to worry: The RedFrog Pub will still offer a full menu of cocktails, beers and authentic Caribbean rums. The line also states it intends to offer brew tours onboard and beer tastings. Perhaps in a nod to Cuba’s imminent reopening to American citizens, Carnival’s new Havana Bar celebrates Cuba’s historic past, serving up traditional cocktails and bites during the day, and transforming into a Latin-themed dance club by night. Carnival Vista will feature ABB Azipod propulsion units like the ones shown here. Photo courtesy of ABB. On the technical side of things, Carnival Vista becomes the first Carnival cruise ship to be fitted with ABB Azipod propulsion units since the Carnival Miracle back in 2004. The line has resisted the technology, which consists of a series of outboard-style propulsion units fitted beneath the ship’s hull, but has adopted it for Carnival Vista. 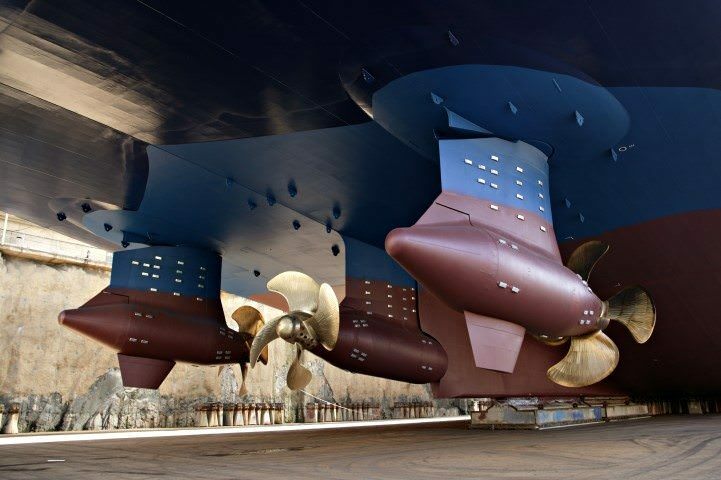 By using these Azipod propulsion units, it eliminates the need for traditional flap rudders, which increases Carnival Vista’s maneuverability substantially. Because the propellers on an Azipod face forward towards the bow when in motion, they effectively “pull” the ship through the water instead of pushing it like traditional rear-facing shaft-and-screw propulsion systems. 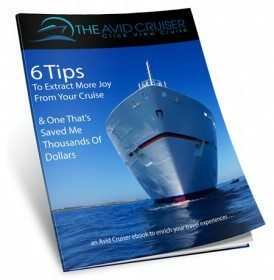 What does that mean to the average cruiser? Not much. To Carnival, however, it could mean a dramatic improvement in efficiency over previous vessels, and a marked reduction in overall fuel costs. And that keeps ticket prices affordable. Carnival Vista sets sail on May 1, 2016.